As I mentioned in an earlier post, I will generally take barbecued beef ribs over pork ribs any day. However, one of the problems with that statement is that it's becoming increasingly difficult for the average Joe (or John) to find standard beef ribs (a.k.a. dino bones) that are worth cooking. The problem is that the meat cutters would rather scallop the meaty goodness out of the ribs as they separate them from the rib primal. This allows them to charge prime rib prices for what would otherwise be "throw away" rib meat. This is why almost all the ribs you see in your local mega-mart look like something left-over from an episode of Texas Chainsaw Massacre. 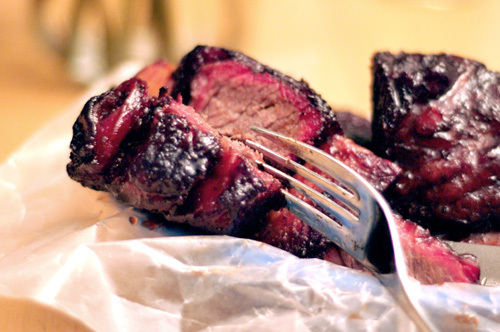 As an alternative, you can use meaty beef short ribs. These are the small rectangular pieces that are cut from the chuck/plate primals. They cook a little faster and provide the same beefy rib flavor. Mix the seasoning ingredients well in a small mixing bowl. Coat the ribs with the Worcestershire sauce just enough to wet them. Dust all sides of the ribs liberally with the seasoning, cover and refrigerate two hours. Cook the ribs indirect, bone-side-down, for two hours. Note: The meat on my ribs was about 1 1/2" thick, and they were about 3-4" long. You will have to adjust your cooking times according to the size and meatiness of your ribs. 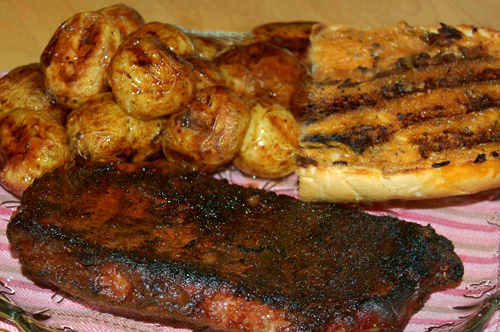 Dump the root beer in a large disposable aluminum foil baking pan and add the ribs (on their sides). Cover the pan with heavy-duty foil, return to the cooker, and cook indirect another hour. Remove the ribs from the pan, return them to the cooker, and cook indirect another 20 minutes. Glaze the ribs with the barbecue sauce during the last ten minutes of cooking. Remove the ribs from the cooker, tent with aluminum foil and let rest 10 minutes. I'm sure that most people have tried some form of this summer salad. 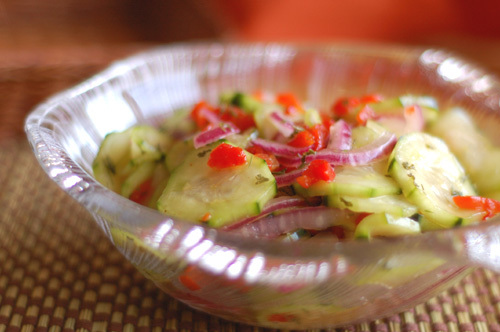 Cucumbers and red onion are a great combination, and the sweet and sour dressing basically pickles them. I've added pimento and a combination of herbs that helps to give the salad a little added depth of flavor. The salad pairs beautifully with grilled meats and other summer fare. This is best made the day before you plan to serve it, but a few hours ahead will work if you are in a hurry. Toss to combine all the ingredients, until the sugar and salt are dissolved. Cover and refrigerate overnight (or at least three hours), tossing occasionally. Here is a simple recipe that will add a new dimension to your steak. I used top sirloin, but any quality steak cut, like ribeye (my favorite), T-bone, porterhouse or flat iron (vastly under-rated) will work exceedingly well. I call it "cowboy" because of the use of the Gebhardt's chili powder. 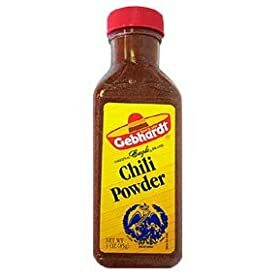 It's renowned for use in "Texas red" chili. As always, click the picture for a closer look. Note: If you can't find the Worcestershire pepper, just rub the steaks with a little Worcestershire sauce before seasoning. Mix the seasoning ingredients in a small bowl. Dust both sides of each steak liberally and pat the seasoning to ensure it adheres well. Let sit covered at room temperature for an hour. Fire your grill up to 500* and let the grates get rocket hot. Swab the grates quickly with canola oil. Remove from the grill, top each steak with two 1 Tbsp pats of butter and let rest five minutes. Well folks, I'm about to come to the end of my fourth competition BBQ season. I'll be competing at the Eagle BBQ Cook-Off & Spudfest this coming Sunday and Monday (September 6 & 7) at Guerber Park in Eagle, Idaho (just barely northwest of Boise). This is a great event at a really nice venue. I'm told it'll be even better than last year, which means it will have plenty of outstanding food and family fun. If you are in the area, please stop by and say hello. 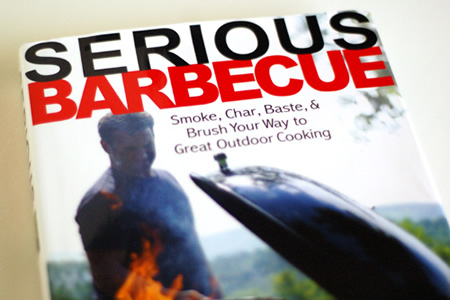 I always enjoy talking barbecue with folks. The two main charitable beneficiaries are The Idaho Foodbank, and The Wildland Firefighter Foundation, which are both great causes. Update: Here are my results.